Most of my family knows that I have a long, problematic relationship with squirrels. Over the years, I’ve received gag gifts such as squirrel calendars, magnets, and even a shiny metal squirrel nutcracker. But few people know the details of how my outlook evolved from that of the typical New Jerseyan—thinking of squirrels as cute, harmless neighbors—to my current state of barely concealed loathing for the furry little (and I admit, cute) beasts. For the moment, this is exclusive, internet-only content. Although if I decide to put it into print, them’s the breaks. That’s the way it goes for you internet whores. And now, a charming tale of attempted extermination [link to story]. 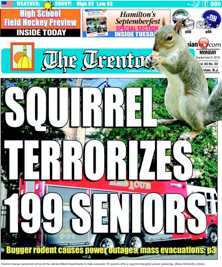 "Squirrel causes power outages, mass evacuations at Trenton senior centers"